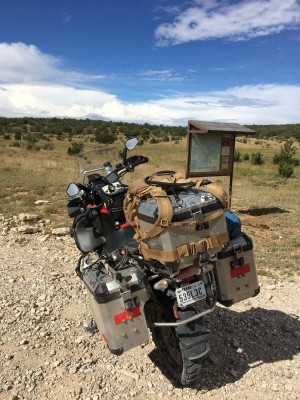 Our latest Fan Friday is Mark Corsetti from Spring, Texas and uses the handle AdvenchaB4Demencha advrider.com. Currently Mark is ridding a 2013 BMW R1200GSA & 2009 Suzuki VL800 Boulevard, gotta have a cruiser just for shits and giggles says Mark. Corsetti first became interested in the off road world when he had applied for the 1991 US CAMEL TROPHY Team coordinator. At the time Tom Collings, told him that the best applicants have off-road motorcycle experience in additional to four wheel driving experience. So he immediately went out and bought a Yamaha XT350. While in Australia travelling solo from Brisbane to Darwin 9,000 kms on a BMW R1200 Mark was up in the northern territories, fairly remote and came across the Katherine river. To ensure a safe crossing he walked the whole crossing, checking for holes, and anything else that might get him stuck. All was well until I rode about 6 inches too far to the right and entire bike submerged in a 6 foot hole. Mark did kill the engine before she submerged like a U-boat. It was four hours of exhausting work to dive down (fresh water so no crocs), untie all my gear, fabricate a web harness from all the straps and physically haul that R1200 up and out of the water to where he could stand it up, then push it over river rocks to a dry spot. After sufficient drain time he checked & drained the air-box, dried the filter, checked fuel & oil, pulled the plugs and that it fired right back up with lots of steam out the exhaust. The bike didn’t have crash bars, so a valve cover was cracked and tore all the plastic bits off – but she was intact. At that point, Mark swore that if a GS could handle this type of situation, then a GSA must be even better and that one day I would own one of these magnificent bikes. Mark sure loves his BMW bikes! Mark tells me the best part of living the ADV lifestyle is arriving to a camp site solo and invariably making new friends over a beer or food. Corsetti also told me wne of the most impactful tips Mark has learned while riding off road is to look far ahead, pick the right line and power through it. After dropping his R1200 with the OEM BMW crash bars that didn’t protect very well Mark was researching the repair costs. That’s when he came across AltRider and the reputation for protection, now his R1200 has AltRider crash bars.